You guys, i’m still sort of in a New York state of mind. Just look at that skyline, will ya. 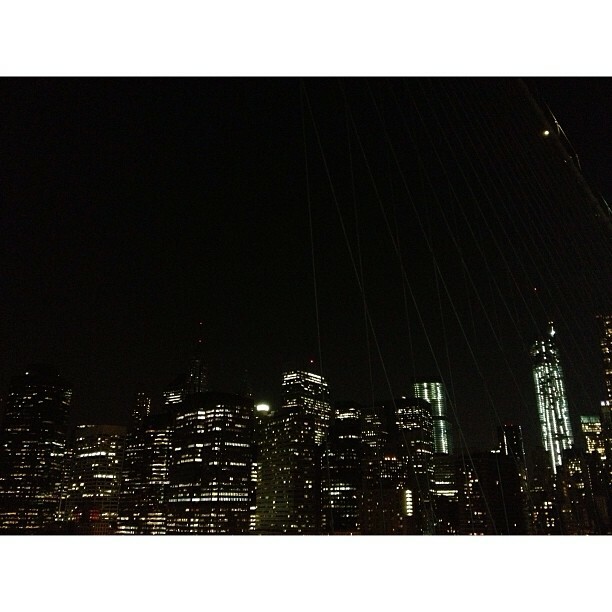 I’m a sucker for a good city scape and this view from the Brooklyn Bridge was swell. My quick vacation last weekend was full of activities. I like to think we did touritsy things like a local. Saturday was spent at Coney Island eating corn dogs, soaking up sun, and riding the ferris wheel. I managed to bike around Brooklyn for two days without getting hit by a car! And I saw Lady Liberty for the first time from Red Hook. Definitely had a chicken bisciut from Pies ‘n Thighs, because it’s not a trip to Brooklyn without it. Oh, and I had my first New York bagel. Then ate one every morning after. I geeked hard over the New York accents I heard while wondering the streets of Brooklyn. It’s so fun to listen a dialect different than what you’re always hearing. I also caught not one, but two subway performances. I definitely wish I had more time to waste in New York/Brooklyn, but it’s a good feeling to be home and in familiar territory. What’s your favorite part about traveling? Trying new things? Seeing sights? Soaking up a different culture? Or maybe how much you appreciate your own bed when you finally get home?